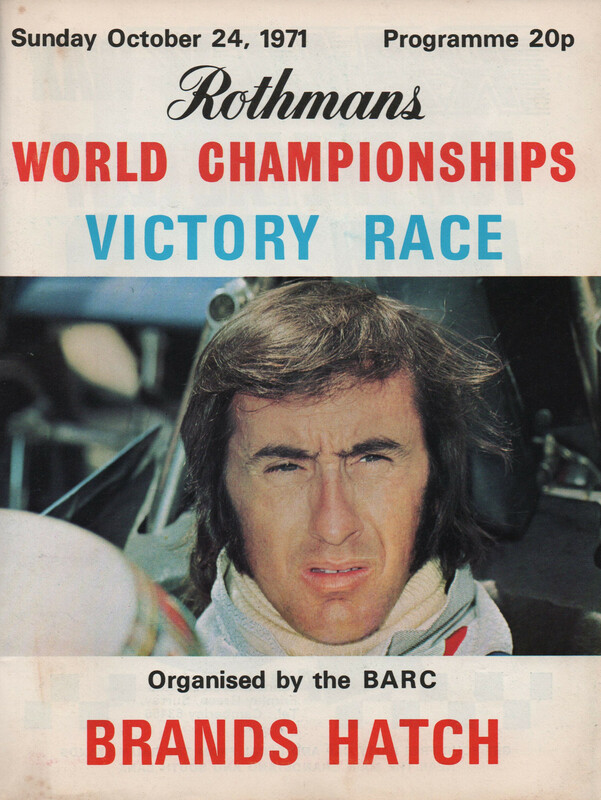 The Rothmans World Championship Victory Race was a motor race, run to Formula One rules, held on 24 October 1971 at Brands Hatch, Kent. The race was to be run over 40 laps of the circuit, but was stopped on lap 15 following the fatal accident suffered by Swiss driver Jo Siffert. The result was taken from the race order after 14 laps, with Peter Gethin being declared the winner in his BRM P160. The entry included several Formula 5000 cars which were contesting Round 12 of the 1971 Rothmans European Formula 5000 Championship. Although the race only lasted for less than half of its intended distance, there were several incidents. On lap 2, Henri Pescarolo and Reine Wisell collided at the Druids hairpin, with both cars retiring. Then Mike Hailwood and Ronnie Peterson also collided and had to pit for repairs. Hailwood's car was deemed unfit to continue, but Peterson rejoined the race, albeit nearly a lap down. Siffert had fallen several places at the start, but had made his way back to 4th by lap 14. Approaching Hawthorn Bend at high speed on lap 15, Siffert's BRM suffered a mechanical failure which pitched it across the track into an earth bank. The car rolled over and caught fire, trapping Siffert underneath, and he died in the flames. The race was stopped with the track blocked, and all the cars were stranded out on the circuit except for John Surtees, who was able to drive around to the pits, his car damaged by debris. ^ "Rothmans World Championship Victory Race". British Automobile Racing Club. 24 October 1971. Retrieved 6 February 2018. "The Motor Racing Year No.3", Anthony Pritchard, 1972. This page was last edited on 17 June 2018, at 16:24 (UTC).